Photo industry shows are much more orderly than computer expositions. They are older - photo shows have been a staple since the 1950s - and they seem designed for a slower pace than events like Computex and CES. Developments in optics may still follow the slow and steady evolution of the past, but digital imaging is clearly a fast moving electronics market that is evolving just as fast as computer technology. Photokina is still every two years, but every two years no longer even covers new model DSLR introductions. They have slipped from two years to 18 month cycles, and we now see models like the Canon 50D just one year after the introduction of the 40D. Certainly this evolution has lessened the importance and relevance of a show viewed as "the" photo show, but there is still enough new at Photokina to keep the market interested. Like other recent photo shows, the biggest announcements seemed to happen in the days leading up to Photokina. The two biggest players, at least in terms of market share, used Photokina to launch new DSLR models. The new DSLR everyone expected at Photokina is the Nikon D90, which you can read about in our pre-show coverage of the D90. 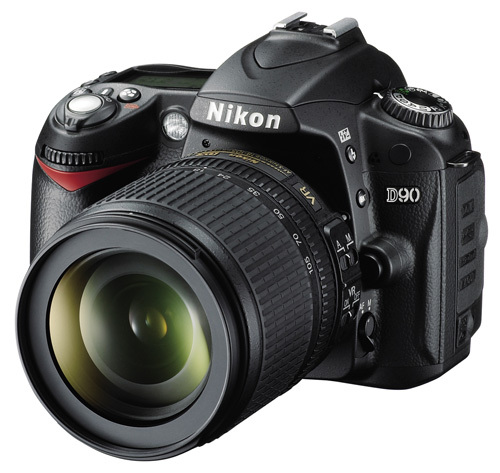 Everyone expected Nikon to replace their aging D80, and the D90 brought the Nikon 12.3MP sensor to its consumer line. However, the surprise was that Nikon was the first to bring HD movie capabilities to a Digital SLR. The Canon 50D was the most unexpected DSLR announcement, as the 40D is barely a year old. Things are not supposed to move that fast in DSLR land. 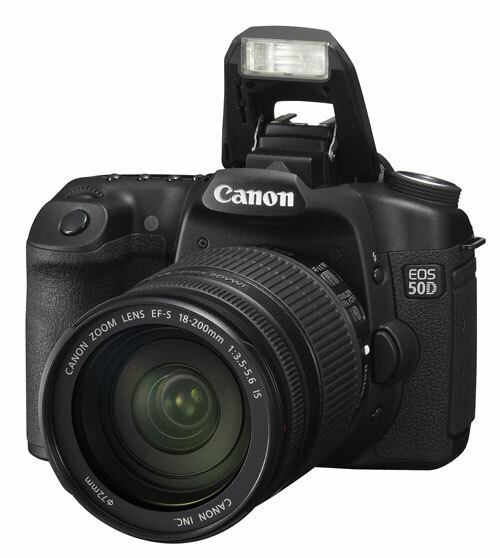 It appears the competitive environment pushed Canon to crank up their release schedule, and so we have the Canon 50D. With 15.1MP, a now similar hi-res LCD to the competition, and ISO options extended even further, the 50D now looks like it should compete very well in the prosumer space, keep Canon loyalists, and possibly win some new users to the Canon camp. The 50D also grabbed the APS-C megapixel crown from the 14.6MP Pentax K20D, but like the 12.4MP Nikon D300, Canon also promises excellent performance at high ISO in very low light. The 50D even trumps the D300 with an ISO 12800 (Hi2) sensitivity option compared to the top 6400 on the D300. Testing will tell us if this "breakthrough" feature is truly useful. Panasonic, who has been a tiny player in the DSLR market, threw caution to the winds in their quest to win market share. The new G1 is the first interchangeable lens digital to throw away the mirror box and go for truly small. 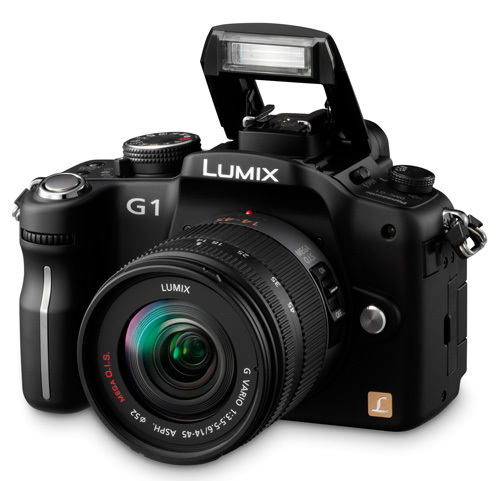 The Panasonic G1 uses the same-size Four Thirds sensor championed by Olympus, Leica, and Panasonic themselves. Also featured is what is claimed to be a truly fast-focusing full-time live view, and a higher resolution 12.1MP MOS sensor. Olympus also has Micro Four Thirds cameras under development. Being the leader in image manipulation, I am surprised that Adobe gave no details as to what CS4 is capable of ? This is an assumption on my behalf because I am sure you guys at Anandtech.com *would* report the nitty-gritty if it were made available . . . right ? The info provided by Adobe was short on specifics and big on sweeping generalities in the Press release. Adobe does claim more support of current hardware and is said to fully support quad core processing. That should interest our readers. CS4 also claims to better support today's graphics cards (GPU) for smoother pan and zoom functions though they don't specify which GPU hardware they are talking about. To be blunt most PS users are forced to upgrade because Adobe makes new versions of its very popular Camera RAW plug-in incompatible with older PS versions. That means when you finally get your newer camera you are forced to upgrade PS if you want to process RAW files in Photoshop. We believed our readers would want to know a new version of Photoshop is coming, and they could find out more it they were interested. You can see the Press Release for yourself at http://www.adobe.com/aboutadobe/pressroom/pressrel...">http://www.adobe.com/aboutadobe/pressro...srelease... We decided not to repeat it. We will know more when Photoshop CS4 and PS CS4 Extended ship next month. Yeah, thats exactly what I did: read adobes support pages, and the list is quite extensive. Albeit not as extensive as I hoped. There's an error in the first chart. The Nikon etc. numbers should read 15.7 x 23.5. Olympus doesn't use the faster, and often more accurate, phase detection for auto focus? Or is it that the compatibility will only extend to the older method of contrast detection? They do use phase detect in their SLRs, along with some having contrast detect capability. The micro-4/3 cameras, as they have no mirror or other means of redirecting light, cannot use phase detect AF. "The prototype has interchangeable Micro Four Thirds lenses and can fit today's Four Thirds lenses with full functionality by using an adapter"
As far as I'm aware the G1 does not have full compatibility with 4/3 lenses, there's no AF unless the lens supports contrast detect AF which is expected to be the same for the Olympus micro 4/3. The press release is vague on the point as it simply says you can mnount the lenses. You are certainly correct that the Press release is less than crystal clear on this point. Based on the info you provide I have slightly changed the description you quote to remove "with full functionality". We are also dealing with a prototype 6 months from introduction and we can only speculate on the shipping product. If your speculation is correct then four current 4/3 lenses support contrast detect. They are the 14-42mm, 40-150mm, 25mm f2.8, and the latest Panasonic/Leica 14-50mm.